Experiencing your bike as it was meant to be ridden is an essential part of taking the open road, but sometimes a little tinkering and modifying can go a long way. 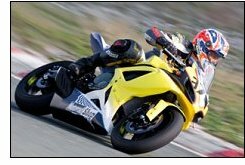 Use our library of motorcycle performance books to improve your bike's safety, operation and overall performance without a mechanic, so you can get back on the pavement with your budget in-check. We have motorcycle repair books covering the repair of your bike's engine, fuel injection, suspension, exhaust, clutch, brakes and more at The Motor Bookstore. You'll find motorcycle performance books and how-to-guides for sportbikes, street bikes, off-road bikes, cruisers and more in our selection. Stock up on motocross books featuring step-by-step mini motocross and dirt bike modifications or learn how to modify a metric cruiser for mind-blowing performance with these great guides. Take your performance projects to new levels with detailed illustrations, customization suggestions, step-by-step guides and tons of photos. The Motor Bookstore has the best selection and lowest prices on motorcycle modification books and motorcycle manuals - so be sure to take advantage today! 101 Sportbike Performance Projects: Suspension, Fuel Injection, Exhaust, Clutch, Brakes, etc.